When we first arrived in Ayutthaya, we didn't think we'd stay all that long. The first couple of days were a bit of a washout on account of the weather, and then we moved to Tony's Place, did a few sight-seeing tours and ended staying another 6 nights there. All in, we'd spent over a week in Ayutthaya, something that most tourists would be hard-pushed to do but we managed it. That was testament to the quality of the room and the downright convenience of the restaurant/bar downstairs; if only they had more than one CD of western music though (after just a couple of days there we instinctively knew that Britney Spears would follow Lamarr would follow Steps, and so on)! 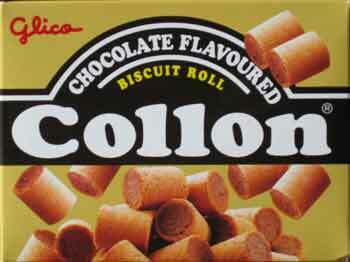 The last thing I bought in Ayutthaya, a packet of biscuits with the less-than-savoury name of 'Collon' (OK, it's not the right spelling, but it's close enough to 'colon' ... and they sure do look like dog biscuits on the cover too!). This morning we packed our stuff up and said our farewells to the various characters at Tony's Place, including the big gun dog who's scared of his own shadow ('Tur-a-dam'), the soppy black labrador-like dog with one protruding tooth and a tongue that permanently hangs out the side of his muzzle ('Luk-moon'), giving the tiles a bit of a clean, and the camp guy working on reception (whose name I never got) who was in full-on mincing mode this morning. If Thai TV ever needs a host like Graham Norton for their schedules, they should send talent scouts to Ayutthaya straight away. We grabbed a tuk-tuk to the place where the Bangkok buses depart (not exactly a bus station - they just line up along Naresuan Road, leaving every 30 minutes or so), but discovered that the place that we had been advised to head for in Bangkok, a place called Victory Monument, was not where these coaches stopped. They stopped much further out, we were told, and so instead went over the road and found a place on a mini bus that could take us right in to the centre. The journey took about an hour and a quarter, and the traffic got progressively worse as we made our way in. We stepped out of the mini bus at Victory Monument and were immediately confronted with the near-deafening noise of the traffic as many lanes of traffic belched their way through this busy part of the city. We had already earmarked a place to stay, a guesthouse/hotel called A-One in the area of Siam Square. I went over to a taxi that had just dropped off its last fare and tried to point out on a large map of Bangkok where I wanted to go. He looked confused, so I pulled out the Lonely Planet which had the hotel marked on a more detailed map of the area around Siam Square. Still he looked confused, and as any good westerner should do, I repeated myself in the hope that it would eventually make some kind of sense. "A-One hotel," I would say, pointing to the location. "Hotel. Yes, hotel," the taxi driver would say, his finger trailing a path that lead away from the point I had just indicated. I gave up with that first taxi driver, working on the basis that we could end up anywhere. I tried again with a second driver, and this time added an extra detail, the name of the road that it was on, something that I could say in Thai. This made little difference, the driver still didn't seem to know where we wanted to go. I tried a third time, this time attracting the attention of a police officer as I waited at a busy road junction for a taxi to come past. The policeman took my map and then tried negotiating on my behalf with a passing taxi driver, although in truth he had few more details other than 'need hotel'. The taxi that he waved into the side road evidently hadn't been enlightened by the policeman, so I tried another tactic - I punched in the telephone number of the hotel into my mobile phone then handed it to the driver, hoping that he could ask the hotel how to get there. Moments later, he handed the phone back looking confused as it was put on hold. Finally, I tried a tuk-tuk driver who very quickly made it clear that he wasn't in the mood for trying to understand what this non Thai-speaking farang wanted, waving his hand as if to say 'whatever it is, I haven't got time for it'. Perhaps I should give Stef a call. Stef is someone I know from back home, although he has been in Thailand for 5 years solid now, and first went out there for some time almost ten years ago. The plan had always been to arrange to meet up (he had offered us a place to stay, which is always nice), but I had wanted to find my feet a bit first before ringing up; besides, Stef had not long ago been admitted to hospital after getting Dengue fever from a mosquito bite. I wasn't even sure if he was better, even if he was in good spirits and cracking jokes from the hospital bed the last time we spoke! Thankfully, he was much better, and even more thankfully (from a purely selfish point of view!) he said that we were still welcome to stay and he'd come to collect us. It turned out that while we might have chosen a good spot for getting on to the Skytrain to Siam Square or hitching a cab (if only they understood where we wanted to go), we chose one of the worst possible places for Stef to make his way into. One of several points in Thailand where the traffic converges, it really was a frantically busy part of this city reknowned for its horrendous traffic problems. Ironically, had we caught one of the coaches from Ayutthaya instead of the minibus, we might have found ourselves dropped off within easy reach of their place in a district known as Bang Su. But then, that had never been 'the plan', so hindsight is a wonderful thing. "Don't say Deek, whatever you do!" Stef said down the phone. "We divorced two years ago, the missus'll go spare!" So, it looks like we had to catch up on the past a little. Or quite a lot, as it turned out. I always knew that Stef liked a wild night out, but his wild days were a thing of the past. Stef told us how he went off the rails a couple of years back and was out every night on the sauce and had gone down to 50kgs and with a 24 inch waste ... I mean waist. But that's the thing, he was running himself into the ground and it took a 'moment of clarity' to bring him back round. He told us how, one night at a go-go bar, there was a guy there whose wife had left him, taken the kids and "not even left him a spoon in the house", just totally cleared him out. Meanwhile, Stef's 'friends' were of the opinion to "just give him another drink, he'll be alright". At that point, he realised that these were not really friends, and they'd never help him in a similar position, so he walked away from them, the partying and turned his life around with new partner Am. The other reason for getting himself sorted presented itself once we got back to the house - little Dylan. Stef's little boy is a 4-year-old, pale skinned boy who looks more like a westerner than a Thai, yet speaks not a word of English. He seemed pleased to meet a couple of new people and also seemed to enjoy talking to us. I wanted to say to Dylan, "Look, we can't even order a taxi ... you won't get very far with us," but of course, I didn't. Couldn't find the words. Dylan is a charming little boy who has whatever the opposite is of selfishness (selflessness?). Anyway, rather than stealing toys from other kids, Dylan likes to go around picking things up and giving them to you. Had I stored up the items he gave me throughout the course of the day, I would be the proud owner of 4 lighters, 2 cups, a comb, a toy fire truck, a hair scrunchee and roughly 7 and a half baht in coins. Dylan is also an epileptic, and does occasionally have fits. To counter that, he does take medication, but that has the effect of keeping him going for longer, like Duracell. Stef would be sat there and, as we talked to him, Dylan would walk back and forth past him too many times to remember. "It never stops," said Stef. "It's like a bad trip, only you're not gonna snap out of it in a day, it's gonna be like this for weeks, years!" We all went out for a bite to eat at a restaurant near the local Tesco shop (yes, it's oh-so-authentic Thai!) and then headed into Tesco as they needed to get a mattress. Although we had a room set aside, Stef had not got a mattress put in there yet, but he assured me that they were going to do that anyway, not just on our behalf. Having picked one out, we ventured back to a tuk-tuk, while Am spoke with the Tesco staff about getting the mattress home. "How will they get it back?" I asked. 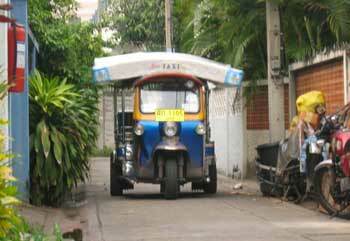 "Oh, they'll probably strap it on top of a tuk-tuk," Stef said. "It's not our problem, they'll work something out." Sure enough, once back at the house we soon heard the familar sound of a tuk-tuk coming up the soi (alleyway) and I went out to see our bedding for the evening strapped on the top of the roof, just as had been promised. Definitely a surreal moment. Our bed for the night arrives, by tuk-tuk. Naturally. This is Thailand, after all. We passed the time chatting, eating and learning a few more useful Thai phrases. Although we've been here nearly a month, we have learned less in this time than on other holidays abroad. Partly this is because most of the places we've been to, the Thais have spoken very good English (Chiang Mai was a doddle, and we only started to hit problems in Phitsanulok ... and then there was this morning's taxi problem! ); partly, the problem is that we haven't felt comfortable asking someone to run through the language with us. Stef had been here for five years though, and with a Thai partner and a 4-year-old boy who only speaks Thai, he was a good person to learn from. "Although I'm useless with the tones," Stef admitted. "If you want to get the tones right listen to him (Dylan), he gets them perfect." For those that don't know, Thai is a tonal language, like many in SE Asia. Hence one word can have many different meanings depending on whether you say it with low, high, falling or rising tones or a plain old flat tone. As such the word 'maa' can mean horse, dog, silk-worm or 'come here'. The possibilities for getting things wrong are entertainingly varied. Of the new phrases we learnt, the one that will probably come in most useful is roughly this: 'mor-dtoop'. It should normally be uttered after first having held a blank stare for at least 10 seconds while listening to a Thai person give you some important piece of information, and this wonderfully compact phrase basically means this: "I haven't the slightest idea what you are going on about!" Because, by and large, this is true. Oh, and about the hotel confusion. Stef explained that there are numbered hotels all over Bangkok with names like 'A-One', hundreds of them, and generally they are the kind of hotels that businessmen would take their secretaries to of a lunchtime, presumably so they could ask them to 'take something down for me'. Thinking back to this morning's conversations, it becomes a little clearer why, to the first taxi driver, 'A-One' hotel just translated to 'hotel, yes, hotel'. Perhaps in his mind I was saying "Take me to a knocking shop" but appeared to be too fussy about the location? Well, we'll never know for sure.